You and I are probably never going to drive a real 1939 Jaguar SS100. In #1 condition, they can go for a million bucks. If you like the shape and the very-open-air driving experience, however, you can come surprisingly close for a little money. 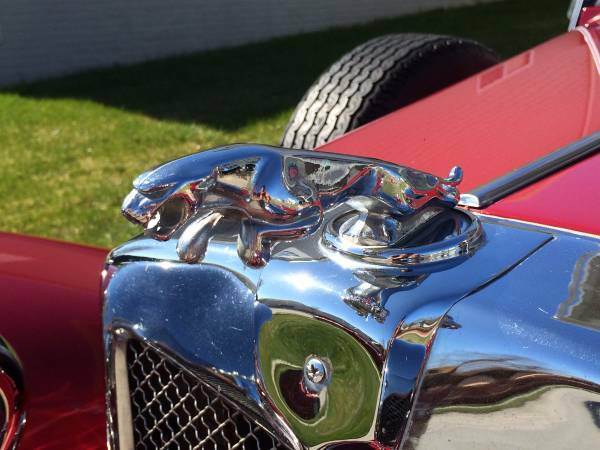 Find this 1939 Jaguar SS100 "Duke" Replica here for sale in Bennington, NE for $7,950 via craigslist. Manufactured by Classic Roadsters of Fargo, ND, this car looks to have the underpinnings of a 2.3 liter Ford product, likely a Mustang II. No, you aren't going to be fooling too many enthusiasts wearing those steel-belted radials and tacky steering wheel, but you can improve upon both of those items relatively easily if you are the new owner. Given what was available to create it, this Jag is still a darn good compromise between usability and authenticity. For the money, it is actually pretty remarkable. Perhaps the best part about this particular replicar is its 4-speed transmission. All too often, replicas are equipped with a slushbox. There is nothing quite as disheartening as looking into the cabin of something like this and seeing the old P-R-N-D-2-1 staring back at you. Who wouldn't rather click through the gears while imagining touring the British countryside? Nothing to see here, folks. Just a Pinto engine and a plastic OOh-gah horn. 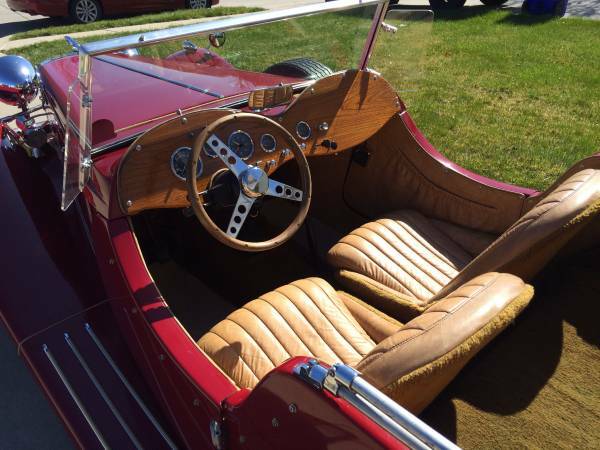 How close is the driving experience to that of a real SS Jaguar 100SS? We will never know, but we can be glad the classic shape of the original is not confined to museums and garages of the uber-rich. This looks closer to an MG T series replica to my eyes. It all seems to ... upright for an SS100. Those wheels and tyres are really off. And I don't feel like this is a situation where that would be an easy fix. You would need 18 inch wires and 18x5.5 inch tyres to capture the look. And I don't know how you find those with a Mustang II stud pattern. As in 'this is what they look like when the wheels are the right size and not something off some lowrider, the ride height is correct, and the tires aren't some '70s white-stripe thing...'? I think you may be right. I figured that with the bazillion applications for the Mustang II suspension someone would have addressed this. In any case, you could probably do better than the Chrysler hubcaps. A switch to a true skinny wheel/tire setup would be a big step down for anything besides aesthetic purposes. 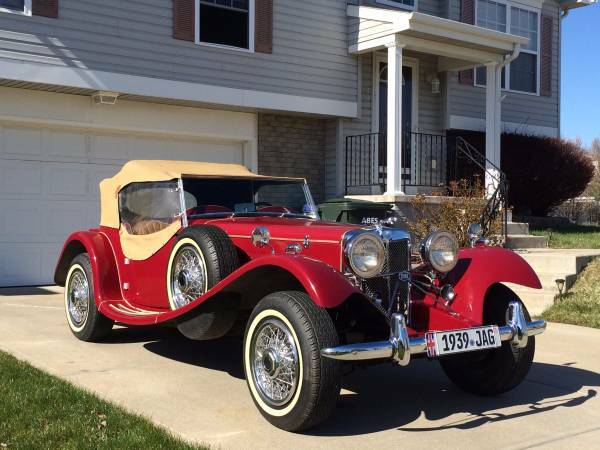 That's surprisingly good looking for a replica kit car. I'm pretty sure you could just call up the Dayton Wheel Company and get wire wheels made in any size and with knock-off hubs to fit any bolt pattern you wish. I'd also want to switch it to inline six power. 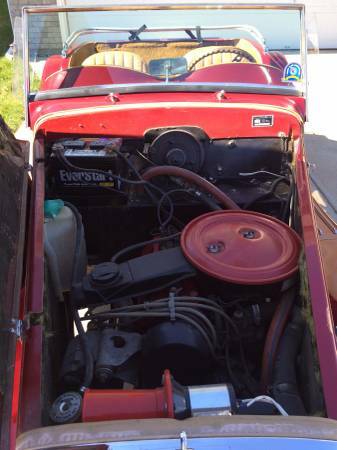 The DOHC Jaguar mill is probably too big and heavy - a Triumph TR6 motor might be just about perfect for this thing.